Like in Bima, Sumbawa Island, Nusa Tenggara Barat. The society contaminated by many culture from migrants who came in Sumbawa for trading and being a missionaries. They came from Arab, Bugis (Sulawesi Island, Indonesia), Melayu (Sumatra Island, Indonesia), China, and other. They persuaded the indigenous of Bima, Donggo’s poeple, push them to live on ridge in Wawo. Most of them, married with the origins and influenced they culture, specifically Islamic culture. They give a new color of the society life. Moreover, the empire of Bima changed became The Islamic Sulatanate of Bima with Sultan Abdul Kahir for the first sultan of Bima in 1620. Because of it, they made a new law for they social life with Islamic law. ‘Mori ro made na Dou Mbojo ede kai hukum Islam ku’ it means, Dou Mbojo, life and death is always with islamic law. Especially for woman, they required to wearing hijab. So, they created rimpu. Rimpu is a clothing with typical fashion of woman of Bima’s community, and may not be found anywhere in this hesmisphere. 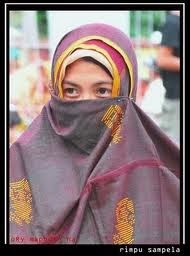 Clothing of rimpu began rapidly in the sultanate period, together with the demands of Islamic law in cover the aurat. This law just for girl and woman who live there. By then, every woman must wear rimpu out of the house and is a disagrace to the family if they leave the house without rimpu. By wearing two pieces of gloves, which one to cover the limbs from the feet up to the navel, while the other is used to cover the upper body from navel to head. Rimpu is like a symbol of beauty for woman. They made it by herself, weaving it. They made their own motive, like nggusu waru, weri, wunta cengke, kakando, bunga satako, and tembe nggoli. So of course, they weared it with tremendous of pride. In the past, rimpu consists of two types. Rimpu Cili / Mpida, commonly used by a woman who is not married. Cili in the Bima’s language means stealthy, and the eyelids are visible only. Rimpu Colo, usually used by a woman who had married. Her face just a part who can looked. But now, because of the modernization’s wave, the youth of Bima leave this manners slowy. 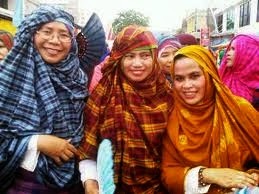 They, the girl and woman, prefer to wearing veil than rimpu. Rimpu is not a simple style and old-fashion, according to their opinion. Only a few woman who wear it, notably the rural old woman. But if you want to find many woman who wear it on the street, you can come to Bima in the end of this month every year. A Mbojo’s festival will hold there.